Years ago, retailing expert Paco Underhill explained how shoppers, particularly females, did not like to be brushed or touched by others in the store. When they did get brushed up against in crowded areas of the store, they tended to move on from the items they were examining. The store often lost a potential sale. Underhill developed this conclusion based on years of anthropological observation of customers in retailers around the world. Now, researchers have conducted a field experiment and confirmed Underhill's conclusions. According to the Wall Street Journal, Brett Martin has published a new study that shows, "Getting touched by a fellow shopper—even an apparently accidental brush—makes consumers less likely to buy the product they're considering." The effect proves more significant if a male shopper brushes up against a female consumer, just as Underhill suggested. The study confirms that retailers need to think about the tradeoffs between utilizing floor space efficiently versus losing potential sales due to the "brush" effect. The thing that I find fascinating about this study is that researchers felt compelled to conduct an experiment to prove Underhill's point. It demonstrates a continued under-appreciation for qualitative observational field research... just one more thing that is maddening about academia! Do Friends Encourage or Discourage Us From Becoming Entrepreneurs? To what extent do peers affect our occupational choices? This question has been of particular interest in the context of entrepreneurship and policies to create a favorable environment for entry. Such influences, however, are hard to identify empirically. We exploit the assignment of students into business school sections that have varying numbers of classmates with prior entrepreneurial experience. We find that the presence of entrepreneurial peers strongly predicts subsequent entrepreneurship rates of students without an entrepreneurial background, but in a more complex way than the literature has previously suggested: A higher share of entrepreneurial peers leads to lower rather than higher subsequent rates of entrepreneurship. However, the decrease in entrepreneurship is entirely driven by a significant reduction in unsuccessful entrepreneurial ventures. The effect on the rate of successful post-MBA entrepreneurs, instead, is insignificantly positive. In addition, sections with few prior entrepreneurs have a considerably higher variance in their rates of unsuccessful entrepreneurs. The results are consistent with intra-section learning, where the close ties between section-mates lead to insights about the merits of business plans. The finding regarding the "discouragement effect" proves rather surprising and perhaps disappointing to some observers. However, the finding regarding intra-section learning proves much more encouraging (i.e. the reduction in entrepreneurship is entirely driven by a decrease in unsuccessful start-ups, suggesting that students may learning from peers how to sharpen their business plans). Free Kindle Version of Book Today! 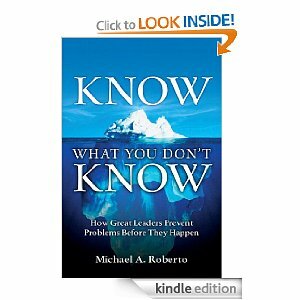 Apparently, my last book - Know What You Don't Know - is available free on Amazon's Kindle today! New version of Everest Leadership and Team Simulation released! I'm very excited to announce that Harvard Business Publishing has just released a new, updated version of the Everest Leadership and Team simulation (Everest 2.0!) which we developed originally several years ago. We are incredibly grateful to all the instructors who have adopted the simulation in the past few years, and who have taken time to offer us useful feedback. We have tried to address many of the suggestions and ideas offered by faculty members and students. We think you will really enjoy the upgrades! I'd like to thank the entire team that worked on the simulation as well. I always enjoy working with my co-author, Amy Edmondson. The team at Harvard Business Publishing is just terrific, led by Heide Abelli and Nicole Harris (Nicole, in particular, did much of the heavy lifting on the revision). Finally, Michael Bean and his team at Forio do a terrific job of software development. By the way, for those who are interested, we have been working on a new simulation. We have a fair bit of work left to do, but I'll post details once we are close to completion. I've posted the official announcement about the Everest simulation from Harvard Business Publishing below, which contains a few details about the upgrades to the simulation. Harvard Business Publishing is pleased to announce that the Leadership and Team Simulation: Everest V2 is now available. This second release of the team-based simulation combines the proven learning objectives and storyline of the original with an updated user experience for both student and instructor. NEW Design—Updated visuals and navigation enhance the look and feel of the simulation while maintaining the principles of the original for continued ease of use. NEW Setup Options—Drag and drop functionality and the new auto-assign feature simplify and expedite team and role assignment. NEW Teaching Materials—The updated Teaching Note reduces simulation ramp-up time. A new Microsoft PowerPoint deck populated with your specific classroom results provides an effective and efficient tool for a classroom debrief session. NEW Performance Tracking—New debrief histograms offer role-by-role comparison of individual goal achievement across teams. Now you can also download results for multiple teams for more powerful results analysis. Many universities now urge or even require their students to travel internationally as part of their education. In some instances, students go on very short trips abroad with faculty and other advisers. For others, their global experience involves a semester or more of study abroad. Some companies also require high potential employees to take an international assignment as part of their career plan. Other firms don't require it, but managers travel extensively abroad as part of key assignments. I think it's important to consider the difference between traveling and living abroad. As I write this blog, I'm in Tokyo teaching an executive education program. It's my eighth year doing so. Each summer, I spend a week or so here teaching senior managers from a variety of Japanese firms. I began to contrast my experience here with the trips I've taken going all the way back to my childhood to visit family in Italy. Here in Japan, I stay at a very nice hotel and eat at restaurants each day. When I go to Italy, I stay with family members in their homes and on their farms. I help out as much as they will let me around the house. I go to the grocery store, gas station, and the park with them. When I was a kid, I went for a whole month several times. The experience differs dramatically. Traveling overseas certainly exposes you to a culture, but it is not nearly as informative as living and breathing the culture day to day. When you stay for longer, and live in a community, you experience the routines and the frustrations of daily life in a way that you do not when traveling for a short time in another nation. Thus, I think students benefit greatly when they go abroad for a whole semester, and executives benefit when they take an overseas assignment. Neither of these is always possible, and so, travel overseas certainly isn't a negative thing. However, to gain a true understanding of what customers need and want in different regions and cultures, living in that environment can't be beat. Does Google need an auteur? The New York Times published an interesting article this weekend about Google and Apple. The article describes a theory outlined by blogger John Gruber at MacWorld Expo two years ago. Gruber argued that innovative firms need an auteur, someone like a film director who calls the creative shots... Like Steve Jobs does at Apple. The article suggests that Apple's auteur approach (Jobs as ultimate design arbiter) excels relative to Google's collaborative design process (many people weighing in on key choices). I have two problems with this argument. First, I think it downplays the level of true collaboration at Apple, and discounts the true contribution of people such as Jonathan Ive. More importantly, though, I think we have to consider whether we should be generalizing based on observations of Apple. Perhaps it is a very unique firm that cannot be easily emulated. Moreover, perhaps it would be problematic to bet on the "lone genius" approach in a wide variety of other firms based on this auteur argument. Recently, Bob Lutz made a similar argument regarding car design. He argued essentially that a dictator approach beats design by committee. However, that assumes a really capable dictator. What if the dictator is less than spectacular? In the Wall Street Journal this weekend, Jonah Lehrer writes about the research of Wharton Professor Jonah Berger. That research focuses on why people share certain types of information more than others. Berger's work focuses on how we tend to share information more frequently when it triggers emotions such as anger and awe. We all know that organizations suffer when information is not shared within teams or across silos. Is it actually even more problematic if people are biased toward sharing emotionally charged information rather than "cold, hard facts" available to them? Does the bias toward sharing feelings over facts make the conflicts among silos even worse? That's the downside one can examine based upon this research? What about the positive recommendations for action? Well, if we want others to pass along data we have shared with them, we might be well-advised to frame the information in a way that triggers feelings and emotions. It's not "just the facts" after all! Whenever an organizational experiences an accident, crisis, or scandal, many people rush to find fault. They want to identify the individuals to hold accountable. They ask about the CEO: What did he or she know and when did they know it? I think we have to resist this urge. We must adopt a more systemic view. In most cases, the problem stems from more than just one bad apple. Firing the bad apple might be appropriate, but that alone won't prevent a recurrence. The systemic issues must be addressed. Apple reported earnings this week, and the balance sheets shows an enormous amount of cash: $76 billion! For the first time, we are beginning to hear more investors clamor for clarity about what will happen with this cash. Some even would like to see some cash returned to shareholders. In the Wall Street Journal today, we see a quote from one investor: "If they can't find ways to use it to grow, they should be returning it to shareholders," said Tim Ghriskey, chief investment officer of Solaris Asset Management, which owns Apple stock. On the other hand, some investors don't mind Apple's financial strategy at all: "It provides me enormous comfort that their balance sheet is so strong," said Mike Binger, a fund manager at Thrivent Asset Management, which owns Apple stocks. As far as he is concerned, "They have the flexibility to do whatever they want with it." 2. A history at the firm of flawed diversification or acquisition strategies. To me, Apple does not raise concerns on these four points. However, the situation bears watching as the pile of cash continues to grow at an incredible pace. I continue to be amazed at how many executives get themselves into trouble with their teams by engaging in what my friend and colleague Michael Watkins calls the "charade of consultation." The charade occurs when an executive makes a decision, and then goes to his team to "consult" them about the issue. The executive might even entertain a discussion of multiple options, yet then steer the dialogue toward the alternative he or she preferred from the outset. Naturally, team members see right through the charade. Such leadership approaches actually diminish trust and commitment. Scholars have shown that people care about the procedural fairness of decision-making processes; they don't just care about the outcomes. When leaders engage in the "charade of consultation," they create the perception of an unfair process. The research clearly shows that perceptions of procedural fairness affect buy-in, trust, and commitment. Do Customers Prefer Products with Small Flaws? The Ideas section of the Wall Street Journal Weekend Edition reported on an interesting new consumer behavior study. The scholars (Danit Ein-Gar, Baba Shiv, and Zakary L. Tormala) examined how people reacted to small flaws in a product. 235 undergraduates participated in this study (ok, so right away, we must acknowledge that one could raise validity concerns based on the sample). The researchers asked the students if they wanted a chocolate bar. The students could see, through the wrapper, that some chocolate bars were slightly broken, while others were not. The researchers intentionally approached some students that were preoccupied, while others were not. The preoccupied students bought more flawed chocolate bars than perfect ones (by a significant margin). The non-preoccupied students tended to prefer the perfect chocolate bars. What accounts for these findings? The scholars argued that the flaw caused the preoccupied students to take notice, to pay attention more closely, and thereby to purchase more chocolate bars. What's the implication for companies? I certainly don't think it means that we should intentionally produce flawed products. However, I do wonder if companies that offer early-stage products might benefit by actively engaging customers and asking them to offer feedback on flaws and potential improvements. Being very direct about possible flaws, and asking for customers to help, may draw their attention to the product in a crowded, noisy marketplace (i.e. one in which consumers are often preoccupied!). Do you see other implications of this research? If so, I hope you will post a comment and share your thoughts. My friend and co-author Lynne Levesque pointed me to a great blog post by Kevin Eikenberry on how to improve brainstorming. I agree with Kevin when he says, "The problem is that we try to brainstorm without a clear problem statement, in the middle of a long meeting, when people are already tired, and they are sitting in a relatively (or totally) sterile, uncreative space." He goes on to offer ten useful tenets for improving how teams brainstorm. I would add one crucial element to his recommended process. I believe that groups need to do some detective work after they craft a problem statement and before they begin to brainstorm. They need to out into the field, use their powers of observation, and collect data about the phenomenon. That means interacting with, observing, and questioning customers and other constituencies. Once you have gathered some of that fuel for the creative fire, then you can brainstorm effectively. Starting with an absolutely blank slate, in my view, doesn't yield the best results. NetFlix: Value-Based Pricing Run Amok? As everyone knows by now, NetFlix spurred a major consumer backlash with its significant pricing increase. As I considered how they might have arrived at this decision, I began to focus on how NetFlix management might have analyzed the value that they provide for consumers. In value-based pricing, companies examine the customer's economics, and they evaluate the cost to the consumer of purchasing an alternative. How would this work for NetFlix? Management would examine the customer's options, and they would calculate how much consumers would have to spend to purchase a service roughly equivalent to the one that NetFlix is offering. If NetFlix executives examined it this way, then you can see why they might have arrived at a decision to raise price significantly. Some have argued persuasively that they don't see a customer-friendly alternative to NetFlix at the $10 per month price point, with access to new releases and a more extensive library of older movies (which NetFlix provides through a combination of DVDs and streaming). Thus, I can see how the decision was made. It doesn't mean that it was a smart move. They clearly created quite a backlash. Moreover, as Nilofer Merchant wrote yesterday, they might have communicated and executed a price increase in a way that did not set off such a furor. What will most interesting, though, will be to see what customers do, not what they say on social media. How many will actually follow through on the threat to abandon NetFlix, and where will they turn. NetFlix seems to be betting that the consumer's options aren't all that attractive, and many will end up sticking with the company despite all the complaining. We shall see. New research by Harvard Business School Professor Lee Fleming and co-authors Matt Marx and Jasjit Singh examines the impact of laws regarding non-compete agreements. In some states, non-compete agreements are essentially illegal. In other states, they are legal. Not surprisingly, their research shows that inventors migrate to states which ban non-compete agreements. In fact, the most productive innovators tend to be most likely to be attracted to states which do not allow non-compete agreements. The researchers point out that California, for instance, does not allow non-compete agreements. Not surprisingly, then, Silicon Valley attracts so many entrepreneurs. Here in Massachusetts, journalist Scott Kirsner has been pushing for the state to get rid of non-compete agreements so as to foster innovation and entrepreneurship more effectively. This study should provide more support for Kirsner's argument. I love this column over at Fast Company by Josh Linkner. He titled it "The Riskiest Move of All." What's that, you ask? Doing nothing at all. It's a simple concept, but it cannot be emphasized enough. Standing still in a dynamic world can be very dangerous for any business. Wait, though... Does taking Linkner's advice mean companies should constantly be tinkering with their strategy? Wouldn't that lead to inconsistency, lack of focus, and an inability to engage in disciplined execution? Here's the way I would approach this issue. Good companies don't stand still, but it does NOT mean changing strategy on a whim. Being active means constantly scanning your external environment, staying abreast of competitors' moves, examining social and technological trends regularly, interacting with customers continuously, and striving constantly to improve internal processes. Being active means asking the "What if?" questions and amplifying potential threats for the purposes of keeping your people vigilant. Being active means playing out scenarios for the future in which major disruptions might occur. An active and vigilant management approach doesn't mean constantly changing direction and purpose, but it does mean being ready, willing, and able to shift direction if necessary. The Boston Globe reported Sunday on an interesting new Chinese study about crowd sourcing. Professors Zhang and Zhu examined the behavior of non-Chinese after the Chinese government blocked it's citizens from seeing or using the Chinese version of Wikipedia. It turns out that non-Chinese reduced their contributions significantly. The scholars conclude that the size of a potential audience affects substantially individuals' incentives to contributeopening source projects. Wharton Professor Todd Gormley, Northwestern's David Matsa, and Washington University of St. Louis' Todd Milbourn have published a new paper titled "CEO Compensation and Corporate Risk Taking: Evidence from a Natural Experiment." Many scholars have argued that stock options increase executive risk-taking, since there is a huge upside with limited downside associated with options grants. These scholars use a fascinating natural experiment to test this theoretical prediction. The researchers looked at firms affected when the federal government added certain chemicals to the list of known carcinogens. They looked to see whether firms took concrete steps to reduce cash flow volatility (i.e. cut risk) after this threat emerged. The scholars found that executives with a high amount of option-based compensation were less likely to try to cut risk to offset the increased risk/threat from the carcinogen finding by the federal government. I find the study quite fascinating and persuasive in providing data to support its conclusion. However, in the article on the Knowledge@Wharton website, I must dispute one key point. Gormley addresses the question of whether risk-taking is always necessarily a bad thing for shareholders. According to the article, "Gormley points to the case of defense contractor General Dynamics as an example of risk paying off." He argues that executives there in the early 1990s took the risk of not diversifying, but rather than focusing on defense, after the national defense budgets began to be cut. He's right that the risk paid off handsomely, as General Dynamics provided handsome shareholder returns through the 1990s. There's only one problem with this argument. I worked at General Dynamics at the time, and I've taught a case study about the firm during that period. When Bill Anders became CEO in 1991, a very aggressive pay-for-performance compensation scheme was put in place for the top 25 executives. However, the compensation scheme was heavily weighted toward cash bonuses. It became very controversial because the executives received large cash bonuses if the stock rose by $10 and stayed there for 10 days. The incredible short-term orientation of that bonus scheme set off criticism from many quarters. 60 Minutes even did a very critical feature on the company. After that, General Dynamics eliminated the cash bonus scheme and shifted to an option-based compensation structure. However, the key decision to not diversify into commercial ventures, but instead to focus on defense, had already been made by Anders and the top team before the options scheme was put in place. Despite this slight inaccuracy, the paper provides a terrific look at a natural experiment with implications for how Boards compensate CEOs. I recommend taking a look. I've coached youth softball now for the past six years. You can learn a great deal about leadership when coaching any team. Here is one key lesson I've learned. In youth softball, girls often become bored at the slow pace of the game. It becomes worse if they are playing a position that they would rather not play. As a coach, you have to remember to explain to each player why their role/position is critical to the team's success. Moreover, you must heap praise on a player who, after perhaps after some period in which they haven't seen much action, then executes their role perfectly to help the team. That moment of positive reinforcement becomes an aha moment when many begin to see how each role is valuable. However, leaders can't stop there. They must continue making it clear how each role is instrumental to team success, because the message wears off if not heard repeatedly. Leaders of all types of teams must remember to take the time to make it crystal clear how and why each role is valuable. Leaders must constantly explain how each member's actions drive team success. They must go out of the way to praise those who may have a role that is perceived as less significant. Take Bill Belichick, coach of the New England Patriots, as an example. Several years ago, after the Patriots won a key playoff game on the way to the championship, he heaped praise on the backup quarterback after the game. However, he had not played at all! Yet, the coach explained how the player's mimicry of the opposing quarterback in practice all week had helped the defense's preparation immensely. Now that is how to make sure each member of the team sees the criticality of his role! Gregory Ferenstein has written a new column over at Fast Company about an interesting new study regarding Facebook marketing strategies. NYU Professor Sinan Aral and Research Associate Dylan Walker examined two versions of a Facebook app used by a company (whose name was withheld). The passive version posted automatically to an individual's newsfeed if they engaged with the brand in any way. The active ersion also enabled consumers to send personalized messages to their friends about the brand. Professor Aral summarizes the key finding: "Passive features are better for spreading a product widely and for quick adoption. Active features, on the other hand, are better for building a loyal customer base and make a product stickier." Moreover, the scholars found that viral strategies, whether active or passive, proved much more effective than traditional banner ads and email advertising. Thank you to Stanford Professor Robert Sutton for recommending this terrific video clip (via Twitter). For those interested in using field observation to drive the innovation, it is a must-see! Here is Part 2 of an interview I conducted recently with Jane Perdue, CEO and founder of Braithwaite Innovation Group. Perdue has extensive experience as a human resource executive, and now a consultant, at Fortune 500 firms. Many changes have been made in employee evaluation and merit review processes in the past decade or so. What are some of the most significant problems that still remain with those evaluation processes? There are many days in which I wish I had a magic wand and could transform the entire performance appraisal process into something practical and meaningful! In my perspective, many of the changes have been in process. An organization can have the most extraordinary online appraisal systems and still fail to move the needle on developing employee performance. There’s too much focus on the form and too little on the content. While a lunch once with a boss, he wrote a few development notes on a napkin – that’s truly the most effective performance feedback I ever received. Performance assessment and evaluation must transcend being simply a document completion process to a corporate-wide mindset and dedication to continuous improvement. A mindset that’s embedded in multiple systems: strategic planning, business metrics, staffing, leadership and succession development, just to name a few. What are 2-3 key success factors with regard to developing sound management succession processes? The process is simple and straightforward, having been pared down to the core essentials with reams of paperwork avoided.